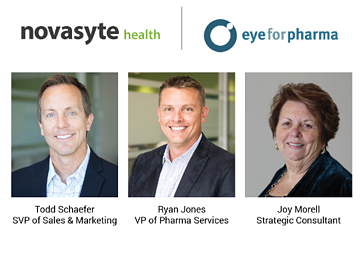 The Novasyte Pharma Services Team will be attending and exhibiting at Eye for Pharma Patient Summit 2018 on Tuesday, October 23rd through Wednesday, October 24th at the Sonesta Hotel in Philadelphia. Patient value has now become synonymous with business value. Companies listening to the growing patient voice and incorporating those insights into the design of products, trials and strategy are being rewarded with higher uptake and better outcomes. Additionally, the conference will include 300+ senior clinical and commercial pharma executives, advocates and patients, including Novasyte. Novasyte's booth will be located in the exhibit hall. The Novasyte Pharmaceutical Services Team looks forward to connecting with attendees and our client partners.